Here's a new product that may be of interest to those of you looking for a portable x-ray unit. The Nomad has been available for a few years now and has been well received by the industry. Now comes a new portable unit from Video Dental Concepts. The shape is more like a conventional camera than a 'ray gun' style, which the company feels is less intimidating in appearance. I don't have any hands-on experience with it, but the idea of it should be appealing to those looking for a portable system... especially with a price of $3995 currently. When the sale is over the price goes back up to $5395. Here are the other points of interest from the company website. If you are interested in ordering or other information, click here. FDA Registered. Welcome to the new way of taking X-rays in Dental Offices: x-ray2go is the way to go! x-ray2go is a portable hand held camera that uses a high frequency inverter to generate a stable X-ray output with DC high voltage. This effective DC unit enables patient and operator to be exposed to the least amount of radiation. 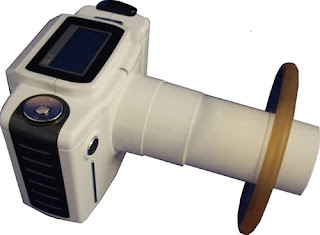 The integrated compact "Camera like" generator increases the user's confidence and decrease the negative perception patients have about X-rays. It is small: 5.6" (W) x 3.3" (D) x 1.2" (H). Best of all it only weighs 4.18 Lbs (1.9 Kgs), the lightest on the market. • No installation necessary versus complex, expensive and time consuming on-wall installation. I'm in Dallas today speaking on cone beam 3D imaging at Benco. If you are in the Dallas area, stop by. Here's today's post about some amazing CE that is FREE! 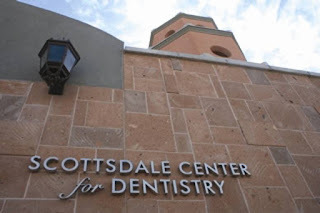 Scottsdale, AZ (October 21, 2009) – Sirona Dental Systems today announced plans to hold two complimentary seminars on CAD/CAM for dentists at the prestigious Scottsdale Center for Dentistry™ on November 12th and 13th or November 13th and 14th, 2009. The CAD/CAM Discovery Seminars, underwritten by Sirona and Patterson Dental Corporation, include not only complimentary tuition and six CE credits (a $1,395.00 value), but also a complimentary one-night stay at the Fairmont Scottsdale Hotel. The complete CEREC AC product line was introduced to the US market in January of 2009. At the heart of CEREC AC is the Bluecam handheld acquisition camera, which uses a highly visible blue light LED (light emitting diode) to harness the full potential of digital impression-taking. CEREC AC provides dentists with a variety of configurations, budget price points, and practice integration options, thus making CAD/CAM available for everyone. To register for the seminars, or for additional information, please call 877-526-3590 or visit www.cerecseminar.com. It's amazing how sometimes posts seem to come in pairs. Yesterday was a post about Google and today I'll follow that with another. Google is now venturing into music search. The idea is a good one for music lovers. Going to the search page brings up a music specific home page and allows the user to query lyrics, artists, etc. Through agreements with many labels and online retailers, links are provided to hear samples and actually buy the music. There is even partnering with Pandora that suggests other artists that are similar to the one you have searched for. Called "Discover Music" the service will premier in the U.S. today. No word on when other parts of the planet will have access. I've tinkered with it for a few minutes and it looks pretty slick. One of the more interesting rumors I've run across recently involves Google and their mapping software. There are whispers that the web giant is working on free (ad supported) app for mobile phones that will provide voice guided turn by turn directions. Free? Yup, that's the rumor. There are similar services available currently, but they charge between $5-10 per month. If Google enters the market with a no cost option, that will seriously shake things up. There are some phones that will already do this. Google helped build an iPhone app and my Palm Pre uses built-in Sprint navigation. However, I've got to think that Google would do a better job. Innovation is what they do. This could be an especially big deal as their Android phone and operating system begin to gain market share. The potential advertising aspect of this has an interesting slant. By knowing your location, ads could be pushed to your phone that feature businesses in the area you are in. Pretty slick, but a bit Minority Report as well. Of course, rumors are just rumors. Yet... this one seems to be picking up steam. I'm giving this one a 70-30 chance of being for real. Do you have thoughts or a comment? Amazon has announced that all new Kindles sold will now go through AT&T for their wireless connections instead of Sprint. When the Kindle first hit the market over a year ago, the wireless data connection that allowed you to download your books and subscriptions on the go was provided by Sprint's EvDO RevA wireless connection. However, recently Amazon announced and began selling an International version of the device which used the AT&T network. I'm not sure where or how the whole thing came down, but now Amazon has announced that all future Kindles (at least for now) will use AT&T. I find that a tad ironic as the newly announced Nook from Barnes & Noble will also use AT&T. If you are an owner of an older Kindle (like me) that uses a Sprint connection, don't panic. Amazon has also announced that no Sprint powered Kindle's will lose their wireless connection. That's good news because if they cut me off after spending $300 on the device 18 months ago, I'd be seriously peeved. Also, it seems to keep up with the B&N Nook announcement, the Kindle is now reduced in price from $279 to $259. For while the company was selling an International version for the extra $20 and a domestic version for less. Now only the international version is being sold which will also work in the U.S.
For a diehard geek like me, a smartphone is just one more piece of gear I've got to have. In fact as the poster child for most earlier adopters, I've had one for several years. I consider it an essential part of who I am and it helps me in so many ways. Now, smartphones are really going mainstream. In fact most people that I know are using their phones for much more than just calls and text messages. It's a beautiful thing, but that also means that as the market of smartphones increases, the chances of viruses, etc also increases. (CNN) -- Worms, spam, viruses and hackers -- they're not just for your desktop or laptop anymore. According to internet security experts they could be well on their way into your pocket or purse. For the full text of the article on CNN.com click here. 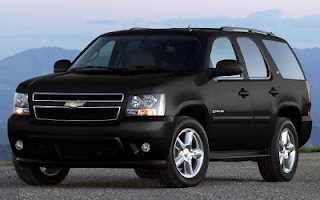 I am now the owner of a 2009 Chevrolet Tahoe Hybrid. I desperately needed a new vehicle (I confess that even though I'm a tech lover, I'm a car payment hater and haven't had a new vehicle in 9 years). So I've gone from a 2000 model SUV to something that I hope is more environmentally friendly and also a lot more high tech. My overall first impressions have been great. Of course first impressions on new vehicles can be deceiving, so I'll be posting about the Tahoe off on and on as I learn more about it. So far, setting up Bluetooth has been a breeze. It's already paired with my Palm Pre and voice dialing is awesome! I'm also impressed with the fact that the Tahoe will e-mail me once a month with all of the vital statistics I need via its OnStar connection. I'll post more as I learn more. Not having had any exposure to new vehicles in so long has, I'm sure, tainted my experience, but things have change a bunch since my last new ride! Check this out! 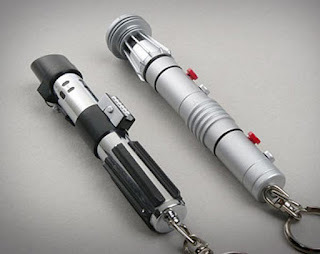 These light sabers are real red laser pointers! This is the kind of thing that brings out the inner geek in all of us. They are available at thinkgeek for only $14.99. My only regret is I wish they were green lasers instead. Green is just so much brighter. Well October 22nd was the big day and Windows 7 is now available for you to purchase on a new computer or to upgrade your existing machines. Times have sure changed for the geeks among us. In 1995, I was in line when Windwows 95 came out. I beta tested Windows 98 and Windows Me. By the time Windows XP came out, I was just relieved that I finally had access to the NT kernel on my regular non-server machines. Then came the disaster of Windows Vista which I've never ever used. Now we have Windows 7 which is being greeted with good comments from the experts and it looks like Microsoft has gotten back on track with the release of the latest operating system. However, at this point I'm not advising anyone to install it on what I call "mission critical" computers. Those are ones that you are absolutely dependent on whether it be for clinical, business, or personal use. Anytime a new operating system hits the market, there will always be hiccups, most notably a lack of drivers. Losing a printer or a x-ray sensor due to an upgrade could be a disaster. So, my recommendation is to stay the course and wait for the dental vendors to make sure all is well with the systems you use. Better to be safe than sorry. In a few weeks we'll all know for sure and we can proceed. Even Apple has had problems with its recent Snow Leopard update (thankfully I haven't experienced them). So if you aren't desperate, wait just a little bit and let things shake out a bit. One of the things that has frustrated me as a Palm Pre user is that the emphasis from most software companies has been on the iPhone and the iPod touch. Now don't get me wrong I completely understand that the iPhone has a much larger user base and deserves the focus that it is receiving. It's just that I'm a Pre user and I need access to info too. So... you can imagine how thrilled I was when I found out yesterday that LexiComp is putting together a software package that will bring the Lexi software to the Palm Pre! Congrats to the folks at Lexi for their hard work and forward thinking to bring valuable and portable info to those of us in the "Land of the Pre". Check out the demo on the video above. Although it's just alpha software, you can definitely see the power of having Lexi with you wherever you go! Do you have trouble remembering things... specifically information on prescribing? Do you often have to consult (gasp) books to find the information you are looking for? Do doors routinely slam as you remove the heavy books holding them open to refresh your memory? If so, you may have Medtechnophobia. This is a terribly debilitating disease affecting many health care practitioners. Fortunately, there is help! View the video above to find out more about this very treatable condition! 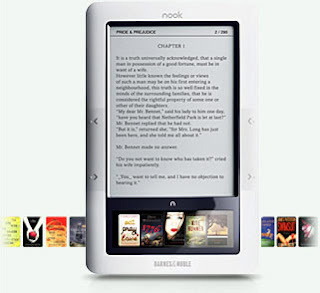 As I reported hear earlier, Barnes and Noble has announced their e-book reader called "Nook". The device is pretty much as I mentioned, e-ink in the top reading area, color touchscreen below. The wireless part of the service is being provided by AT&T and their 3G network (Amazon uses Sprint). It also uses WiFi which is something the Amazon Kindle does not provide. To me, the biggest part of the network is to make sure you have good coverage in your area if you plan to use the wireless features. Memory? Here is the exact text from the B&N website:With 2GB of memory, nook stores up to 1,500 books, newspapers and magazines. Need even more space? Just add a memory card for storage of up to 17,500. An entire library light enough to take with you everywhere, so you'll never be without your favorites. This Friday October 23rd, I'll be doing a live webinar for Ultradent. I've always been a "why guy" and I think it's important for us all to know not only the proper way to provide care, but the "why's" behind that care. Join me for a webinar and Q&A on how to get the most out of bonded and adhesive dentistry. In this Webinar, Dr. John Flucke will explain the importance of incremental curing, quality curing lights, and wet bonding. He will also explain his preference for 5th generation adhesive systems. Other topics to be covered include quality tissue control, laser use, adequate caries removal, the new Spectra device, information on magnification, and auxiliary lighting. If you are interested in registering, you can do so here. Epocrates is continuing to expand its information that is available for the iPhone. There are now several different Resource Centers covering many different topics. Best of all, they are free to members. 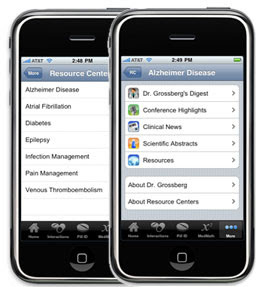 Launch the App Store on your iPhone or iPod touch device. Tap the “Updates” tab at the bottom right of your screen. Select Epocrates and tap “Free” and then “Install” to install the latest version. Well is seems that Amazon isn't the only retailer to be featuring an e-book reader. Rumors are now rampant and Gizmodo even claims to have photos of the new device which is set to be revealed next week. The device has a bit of a Nintendo DS look to it as it has a color screen along the bottom panel and a black & white e-ink screen along the top. The color screen will also be a touch screen although at this time what functionality it has is a closely guarded secret. The software it is running is supposedly Android which was developed by Google. The device will allow owners to purchase books that Barnes & Noble sells and publishes as well as books from the Google Books project. More info should be available after the announcement next week. I've been a laser user for over 10 years now. Lasers have made a definite improvement in my patient care and clinical outcomes. In addition to all of the other technologies we use in my practice, we currently have 5 different wavelengths that we use depending on what we want to accomplish. Chico, CA: October 15, 2009— Lares Research has introduced Wavelength-optimized Periodontal Therapy™ (WPT™), a minimally invasive laser periodontal disease treatment that optimizes the use of dentistry’s two best wavelengths: Nd:YAG and Er:YAG. The method is only available with the Lares Powerlase® AT all-tissue, dual wavelength laser. The WPT method allows the clinician to treat periodontal disease and create optimal conditions for healing. With WPT, the clinician removes the diseased epithelial lining of the periodontal pocket using Nd:YAG energy, removes calculus from the root surface using Er:YAG energy (FDA 510 [K] clearance to market for this indication for use is pending), and seals the pocket after treatment with a stable fibrin clot using Nd:YAG energy. Utilizing both wavelengths in a periodontal disease treatment protocol makes best use of the unique laser/tissue interaction characteristics of each wavelength. The WPT procedure was developed for Lares Research by Dr. Robert Barr. Dr. Barr is a pioneer in laser dentistry and laser education who lectures nationally and internationally. He is a founding member of the Academy of Laser Dentistry, was one of the first to achieve Mastership and Educator status, and received the Leon Goldman Award for Clinical Excellence in 1999. He is a founder and board member of The World Congress of Minimally Invasive Dentistry and was named their clinician of the year in 2004. The WPT minimally invasive alternative to scalpel/suture surgery greatly reduces patient fear and increases treatment acceptance. By offering their current patients WPT, clinicians can see dramatic increases in annual net income without needing to treat a single new patient. The PowerLase® AT is the only dental laser capable of delivering both Nd:YAG and Er:YAG laser energy for the efficient performance of the WPT procedure. Combining both wavelengths in a single laser allows the clinician to quickly and conveniently switch between Er:YAG and Nd:YAG while performing WPT. Lares offers extensive training in laser dentistry, as well as the Advanced Perio and Soft Tissue Course, a two-day hands-on training program focused on periodontal disease treatment and WPT. The course is led by laser dentistry pioneers Dr. Robert Barr and Dr. Mark Colonna. Lares is a recognized leader in the development, manufacture and distribution of oral cutting technology, supplying dentists with precision handpieces and high performance lasers worldwide. The company has been an innovator in the field of dental lasers since it began offering lasers to dental clinicians in 1997. For more information, call 1-888-333-8440, ext. 2050, or go to www.laresdental.com. Facebook has become an Internet force to be reckoned with. Tons of traffic filters through the Facebook servers every day. Of course any time your have that much bandwidth and that many users in one place, you're going to find the less than scrupulous types that show up wherever there are crowds. Recently Facebook has been dealing with a process called "hijacking" from some Facebook apps that should be benign, but are being hacked and used by the less than honest. The most common of these is rogue anti-virus software. Here is the scenario: a user plays a game (like CityFireDepartment which is a legitimate game), but the game has been hacked and the rogue antivirus software is installed. This also hijacks the browser and points it to a new homepage which, surprise, is for the antivirus software. The best recommendation at this time is to avoid these games and keep all your software up to date. Be vigilent! The good folks at Epocrates are always working. Not only do they provide drug and clinical information in a variety of ways over a variety of devices, but they also keep me up to date about current health care situations via e-mail. Recently I received their latest e-mail communication and I thought the info below was of particular value to my readers. The flu season is officially upon us. Here in the KC area, schools have been dealing with full on epidemics that have been keeping large numbers of kids out of school. Last week a family friend reported their daughter went to school one day and discovered she was one of 3 students in her classroom. The rest were home with the flu. So, I thought this was a timely communication from Epocrates. Read on and then consult their online resources. Most patients with 2009 influenza A H1N1 (swine flu) seem to have mild illness and recover without medical care or antiviral treatment. Nonetheless, death tolls continue to rise. 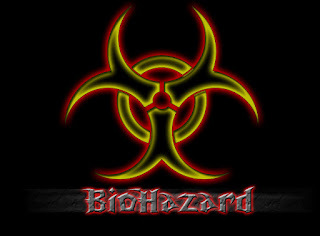 CDC’s MMWR (9/29/09) reported post-mortem results from 77 fatal cases of confirmed 2009 H1N1 flu. Evidence of concurrent bacterial infection was found in 29%, including Streptococcus pneumoniae in 10 patients. These findings underscore the importance of pneumococcal vaccination for those at increased risk for pneumococcal pneumonia and the need for early recognition of bacterial superinfection in flu patients. View our quick reference comparison table for a refresher on who needs vaccination for 2009 H1N1, seasonal influenza A, and pneumococcus, with notes on administering multiple vaccinations. You can also view our vaccine updates.We know you are busy this season; our drug, vaccine, and disease information offers you rapid answers when you need them most. Felt FlexiPoints are the newest adjunct to Cosmedent’s highly rated Enamelize polishing paste and FlexiBuff system. Use Felt FlexiPoints with any polishing paste to put the final luster on composites, porcelain, metal, or natural tooth structure. While Felt FlexiPoints can be used in a myriad of polishing situations, they work especially well when polishing the lingual and occlusal surfaces of posterior teeth. Cosmedent’s Felt FlexiPoints will help you polish even the most difficult to reach areas leaving your entire restoration with a beautiful glossy luster. 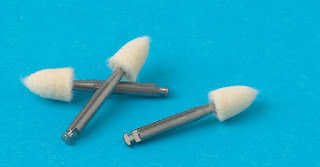 To order Felt FlexiPoints or receive additional information call Cosmedent at 800-621-6729 or visit www.cosmedent.com. I wanted to give a big "Thank You" to the Georgia Dental Society. They were kind enough to invite me to speak at their Fall Meeting held at Lake Lanier Islands this past Friday. I did a four hour lecture on "Digital Dentistry in the Operatory of the Future". They are a great group and the four hours flew by so fast, I actually thought my watch was wrong when it was time to finish up. There was a lot of interaction (which I love) and lots of good and thoughtful questions. I was disappointed that I had to leave to catch a plane right after the lecture. I would have loved to have stayed and gotten to know everyone better. So thanks to all of you who made my Friday so much fun. I appreciate you more than you will ever know. We had an amazing time yesterday! Despite the chilly temps (around 35F when we started) we still had a great turnout for our patient pancake breakfast. Lots of folks came by and enjoyed pancakes and sausage by Chris Cakes. Everyone had to catch their pancakes as they were thrown to them. Yours truly even managed to catch one with a running over the shoulder with my back to the griddle a la Willy Mays. Of course there was no video of that one, but I will remember it with pride! The event lasted from 8:30 until 10:30 and we couldn't believe how many people stopped by. This is our second office breakfast and you can definitely count on another one next year. To all of you who came by, thank you. It was your attendance that really made the morning special. I also want to thank you for your trust in allowing us to provide your dental care. It is a task we don't take lightly and we are honored by your trust. In the next few days, I'm going to begin evaluating ddsWeblink. The idea behind it is to allow for organization and collaboration between the general dentist, specialists, labs, etc. It allows for sharing of CAD/CAM data, notes, photos, radiographs, etc between the different members of the treatment team. It allows for tracking of cases between all the participants and enhances communication. Sometimes in complicated cases, communication is needed between everyone that is providing care and support. Trying to get everyone together for a meeting or a conference call can be difficult especially with more than one doctor involved. ddsWeblink allows everyone to electronically check the cases and respond to questions when they have a moment during the day instead of trying to coordinate between multiple parties. The concept is definitely a good one. I'll be working with the system for a while and then report back on my experiences. Wacom makes great input devices for all types of industries. Although they are mainly found in areas where computer graphic artists are at work, they can also be used in other environments where a need exists to use a mouse that works as a pen. In the health care industry that comes in handy for patients filling out forms and signing documents. They can also be used by doctors for annotating images and radiographs for patients and specialists. I have a Wacom Bamboo system in my office which we use in the treatment areas for drawing on our Guru patient education system, intraoral photos, extra-oral photos, and radiographs. I like the Bamboo system because it does everything I want it to do and is more affordable than the Intuos4. The Intuos4, which can certainly be used in healthcare environments, is a much more robust system allowing for 2048 levels of pen pressure sensitivity for precise pressure control. This is wonderful for artists who need to shade and draw, but probably overkill for the routine use in dentistry & health care. The Intuos4 retails for $229 for 24 square inches of drawing space and increases in price for larger drawing ares. Wacom makes good products and can be counted on to deliver. Only the Physio-Control LIFEPAK CR PLUS AEDs with the serial numbers below are affected by this recall. The serial number is located on the underside of the device. The AEDs were manufactured and distributed from July 9, 2008 through August 19, 2008. Use: This device is used by emergency or medical personnel, by others who have completed CPR AED training courses, or the public at large. It is intended to treat patients in cardiac arrest. The device analyzes an unconscious patient’s heart rhythm and instructs the user to press a button that delivers an electrical shock to the heart to restore a normal heart rhythm. Reason for Recall: An extremely humid environment may cause the LIFEPAK CR Plus AED to improperly analyze the rhythm correctly and may cause the device to delay or fail to delivery therapy. Physio-Control called their customers from August 18-19, 2009 with a follow-up email message on August 20, 2009. The company sent replacements on August 19, 2009. Health care professionals and consumers may report adverse reactions or quality problems experienced with the use of these products to the FDA’s MedWatch Adverse Event Reporting Program either online, by regular mail or by FAX. I've said it before and I'll say it again. The weakest link in security is the human link. Despite the efforts of software, people can frequently be tricked into volunteering info that should be kept secure. Here is the latest story on such a situation that appeared on the Fox.news website. The scale of the phishing attack on Hotmail could stretch further than first thought, with accounts on Google and Yahoo now threatened. Microsoft confirmed on Monday that the popular email site had been the target of a scam which tricked users into revealing their passwords. This led to around 10,000 passwords being posted online. The computer company said their servers were not responsible for the security breach and that individuals had been conned into handing over their details. But it has been reported that more lists have also been circulated with genuine account information relating to email on Google, Yahoo, Comcast and Earthlink, as well as other third-party web mail services. Neil O'Neil, an ethical hacker and digital forensics investigator at secure payments specialist The Logic Group, said up to a million passwords could have been accessed. "Making the breach public so soon after the attack occurred has allowed unethical hackers to access the passwords very easily, even though they were deleted a couple of days ago at the request of Microsoft," he explained. "People tend to have the same password across many accounts — so there is a good chance that individuals have also compromised the integrity of their ebay or paypal accounts too. "The list went through A and B, so you would think whoever released these has more. And if you do the maths, they could have more than a million passwords." Hackers and cybercriminals attempt to trick people into handing over personal details, including email addresses and passwords. Internet users may be directed to false websites, set up to mirror legitimate websites, that feed information back to the criminals. A Microsoft spokesman said: "We are aware that some Windows Live Hotmail customers' credentials were acquired illegally by a phishing scheme and exposed on a website." They added that they requested the details be removed from the internet and they launched an immediate investigation. The company are also taking measures to block the accounts which were hit. A spokesman for Google said they were aware that some gmail accounts had been part of the phishing scam and said — while their servers were not responsible — they had taken steps to ensure security. And a spokesman for Yahoo said they take great effort to protect their users' security and that they urge consumers to take measures to secure their accounts whenever possible, including changing their passwords. Well I'm back from the trip to Hawaii. It's such a beautiful part of the world that it's almost impossible to go there and not enjoy yourself. I got to snorkel, chase dolphins on a catamaran, visit the Dole plantation, build sand castles, and also meet some really great people in our profession. The meeting was well organized (as the ADA meeting always is). All of the things that I relied on the organizers to do for me was done perfectly and seamlessly; which is always nice when you are speaking. The Hawaii Convention Center is a beautiful and clean facility. The A/V crew were top notch. Although I didn't hear any solid attendance numbers while there, I can tell you that classes were packed. I saw tons of "sold out" signs on lectures as people filed in and in some cases long lines of folks hoping someone wouldn't show so they could go in. Both of my lectures had lots of good questions which, for me, is always the best part. On the floor, things looked pretty busy. I heard that there were some slow times, but overall attendance both in the CE and in the exhibit hall was good or better than expected. Most of the vendors I spoke with indicated that sales were very good. There seemed to be more sales in the restorative and small goods markets than in the equipment market, but once again the overall impression was positive. I just wish Hawaii was closer! We left last night (Sunday) at 5:00 pm and didn't get back to KC until after 9:00 am. Of course it was the same type of thing on the way out... only backwards. One other point to make. The people of Hawaii are so wonderful. Everywhere we went there were smiles, jokes, and a constant effort to make us feel warm and comfortable. We can all learn something about how to treat others from the folks in our 50th state. And in closing, a special thank you to the ADA for allowing me to speak at the meeting. I'm always honored by their confidence. On behalf of Zap Lasers, LLC, we are pleased to announce effective October 1st , 2009, Zap Lasers will enter into a strategic partnership with Discus Dental, LLC, the worldwide leader in professional whitening, oral hygiene, restorative and endodontics products. Over the past 10 years, Zap has earned a reputation as the leading innovator in dental soft-tissue lasers with products such as the Styla MicroLaser (the world’s first handheld laser) and the ever-reliable SoftLase Pro, OrthoLase and HygieneLase products. This new partnership between our two dynamic organizations, will expand the global opportunities for lasers in dentistry. Under this partnership, Zap will continue to develop and produce high–quality, technologically advanced dental laser products, and Discus will leverage its global distribution channels and marketing resources to sell laser products worldwide. Zap will continue to provide technical support and customer care to laser customers. When you contact customer support at (888) 876-4546 you will be speaking with the same support team you’ve used in the past. Effective October 1, 2009 all laser products and accessory items can be purchased through Discus Dental at (888) 217-8822. We appreciate your business, and look forward to this partnership with Discus as an opportunity to expand and enhance our offerings to you. Digital cameras just keep getting better. I'm currently walking around with a Canon that has 10mp resolution and the ability to shoot video and I paid $200 for it. Amazing! However, that's not as amazing as the camera in the picture above. 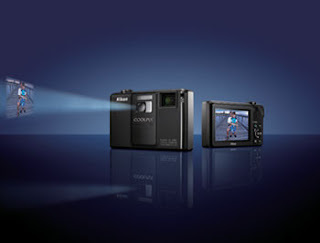 The Nikon Coolpix S1000pj is an amazing digital camera. It has 12.1mp resolution and a grocery list of other great features, but the most amazing one is that it has a built-in projector. Sweet! All the details are at the company website. Where was this shield when the Wii was first released? If you don't remember, there was a whole rash of broken flat panel due to flying remotes at the time. Hopefully those days are behind us and you wouldn't be as likely to need one of these in your home, but there are definite uses for TV Armor. If you have a TV or some type of flat panel display in your reception area, this could be a nice addition. When I built my new office 18 months ago, we put the dual screen up high so that the risk of accidents would be minimized, but if you don't have that luxury this could definitely help keep the display in one piece. I've seen these in kids rooms in airports where the TVs are low so the little ones can see them, but that also makes them easy to touch. 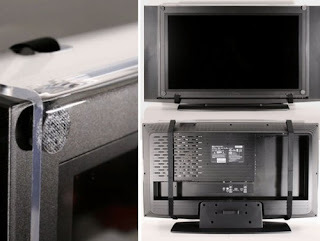 The TV Armor guards them against disaster. If you'd like more info, here is the website.